I don’t have a plan. Only a sketchy idea in my head. I just want to ride. As I shared my plan to ride, most were surprised. Some were skeptical. Many thought I was just plain crazy. Yes, I intend to make a trip up north, quite very north. Nope. Not a detailed plan. Just a sketchy idea of the route. The Mae Hong Son loop near Chiang Mai, Thailand, is on every motorcycle enthusiast’s bucket list. With more than 1,800 turns and twists, it’s never a boring stretch. Ever since I’ve heard of the Mae Hong Son loop, I’ve been dreaming of doing it on a motorcycle – my own motorcycle. And now that I have some time on hand, I thought why not! And since I’ll be up in Chiang Mai, I thought I’d also take the opportunity to tour the region. And so the crazy idea of doing a 5-country tour on the bike struck me. Singapore, Malaysia, Thailand, Laos and Cambodia. I’m giving Myanmar, Vietnam and China a miss as my research suggests that trying to enter these countries on a foreign-registered motorcycle is, while not impossible, difficult and messy. It’ll involve applying for some pricey permits prior or hiring some mandatory escorts. No thanks. I’d rather be travelling on my own. I’m riding a small 2B bike. Many long distance tourers appear to make their trips on machines with 600cc and above. This makes my Pulsar 200NS – a humble Indian-made 200cc single cylinder puny by comparison. Some have suggested that I fly up to Chiang Mai and rent there. But really, that takes away half the fun! It’s a Bajaj. Ba-what?!? Bajaj. Yes, it’s made in India and quite very popular there. But in most other parts of the world (including where I’m heading to), it’s a relatively unknown brand. Which also means that should a breakdown happen, parts sourcing is going to be a nightmare. Things would be very different if I had a Honda, Yamaha or BMW. I’m a P-Plate rider. That’s “probationary plate”. I’ve only obtained my riding license in January this year. Couple that with the fact that I drive on most days and ride only weekends, this gives me the equivalent bike-on-road experience of about 2 months or so. It’s a 2,500km one-way journey on a stock seat. And that’s just Singapore to Chiang Mai. Roughly the equivalent of SG-KL (x7) seven times. I’ll estimate the return journey to be approximately 8,000 to 10,000km. And as the Pulsar 200NS was not exactly designed to be a long distance tourer, I’ll have to plan for at least 1 maintenance stop somewhere along the way. I’m doing this solo. Yup! Solo. With a multi-week ride like this, it’s not easy to find a group or riding buddy to tag along. So I’ll have to do this alone. But I figured that the main advantage is that I get to travel at my own pace and that means true freedom – the very symbol that motorcycle travelling represents! It’ll force me to get out of my comfort zone. I’ve never went on a road trip beyond KL. I’ve always wanted to do Penang but never found the opportunity. But this ride is going to make my previous SG-KL trips seem minuscule in comparison. It’ll force me to make new friends. I’m a natural introvert. And being around strangers make me uncomfortable. But a solo trip is anything but solo. With a travelling companion, we tend to lean on each other and stick to the familiar group. But going out alone forces me to get to know people and make new friends. This is not a crazy idea. I fully encourage you to go on this epic journey. 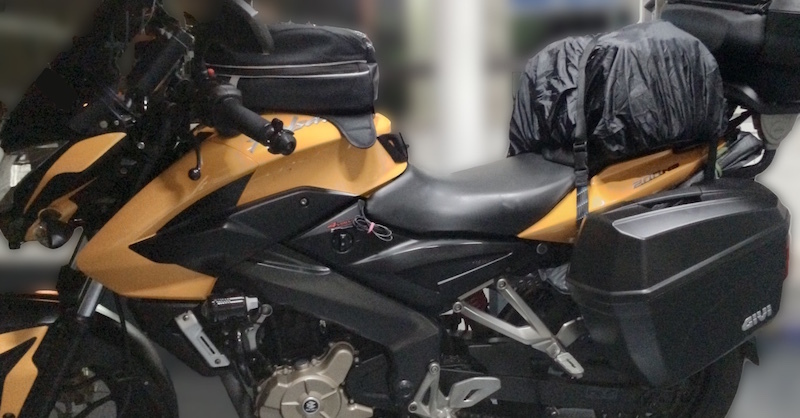 My wife and I have been talking about riding to Thailand from SG for the past 20 years but never got down to do it. Now in our late 40s and our kids all grown up, we will be doing it. Please stay safe and I wish you all the best! Thanks bro! That’s so cool – does your wife ride too? Or are you thinking of doing the trip 2-up? My wife will never dream of doing a trip like this with me. She seem adverse to motorcycles and most things 2-wheeled. I’m just glad that she’s not against my idea of riding up. Yeah! And you should totally do it soon! My wife doesn’t ride but she’s a travel bug and from the day we met on our first date, she sat on my motorcycle and fell in love with riding. When we were much younger we couldn’t travel as the kids were very young. But now that they are all grown up, time for mum and dad to venture away! Our Thailand trip is confirmed for December 2017 and we are both so looking forward to it. Anyway, I am looking forward to your trip report. Ok, time to go now as my wife and I are leaving for Mersing now for a day ride. Take care and be safe bro! Ah! That’s really nice! For the sake of your missus, I sure hope you have one of those more comfy tourers! 2-up on a smallish machine like what I have can be rather torturous! Good luck for your trip. Will be waiting for your ride report. No worries as wave 125 have reach London . So I doubt your bike cannot complete the route you planned . Yeah – I have one of those 4L water bags I bought from Daiso. It’s filled and sits in my side box. Hurray! I salute U Bro for having the courage to attempt this ride ALONE…. Please DO PLAN & PREPARE VERY THOROUGHLY. Please take GREAT CARE while riding and even while U are not riding. Most of all, HAVE FUN!!! Life is SHORT, JUST DO IT while U still can! Cheers! Good luck mate, don’t forget there is a whole community of bikers out there to help you if you have any problems on the road, http://www.rideasia.net and others are a great reference for information on border crossing etc I’m actually in Malacca at the moment and done all that ride you have mentioned over the last 9 months so if I can be any assistance send me a message and ill be glad to help out of put you onto someone that will be able too, rubber side down always. Heya Sheldon! Yup, I’ve been studying rideasia.net and gt-rider.com postings and forums in the days leading up to the trip. Thanks for the offer and the tip! May i know what are the documents that has to be get prepare in advance for the border crossing with your bike? such as where to get those permits and insurances. i’ve done what you did solo last year Dec 2015 – Jan 2016! yes solo! 27 days of riding and wandering around! akin to what you said, “People think that you are crazy!” but really, they don’t know what they are missing! The BMW R1200GS is one HELLUVA TOUGH BEAST! Antonio on Why do motorcycle front and rear tires have opposite tread patterns? Dragging Clutch - BMW R1200GS Forum : R1200 GS Forums on Difficulty Finding Neutral on BMW R1200GS LC? It Could be This! JD on IU Power Re-wiring – Legal or Illegal in Singapore? sgBikerBoy on IU Power Re-wiring – Legal or Illegal in Singapore? Olivia Hon on IU Power Re-wiring – Legal or Illegal in Singapore?